It has been a lazy and relaxing weekend here, we all love nothing more than a good sleep in. There has been a lot of rainfall for Autumn and the weather has turned cool and crisp. In my house, breakfast usually consists of cereal, toast or yoghurt. Yesterday morning, Mr 12 requested pancakes and who am I to refuse a hot breakfast to a growing preteen boy? Ive been meaning to attempt making buttermilk pancakes for a while and I remembered I had a carton of buttermilk in the freezer that I bought some time ago on clearance. Have I mentioned I love my deep freeze? I quite positive I have an unnatural affinity for that thing! Having a large freezer enables me to stock up groceries when they are heavily reduced or on clearance. It also allows me to cook in bulk, and freeze the leftovers for another meal. Doing this has really helped reduce our grocery bill. This recipe does make a lot, so if you are only cooking for a couple of people you may want to half the ingredients. In a large bowl combine the buttermilk, eggs, butter and sugar and whisk well. Then add the lemon zest and flour. Mix it all together until it becomes a smooth batter. 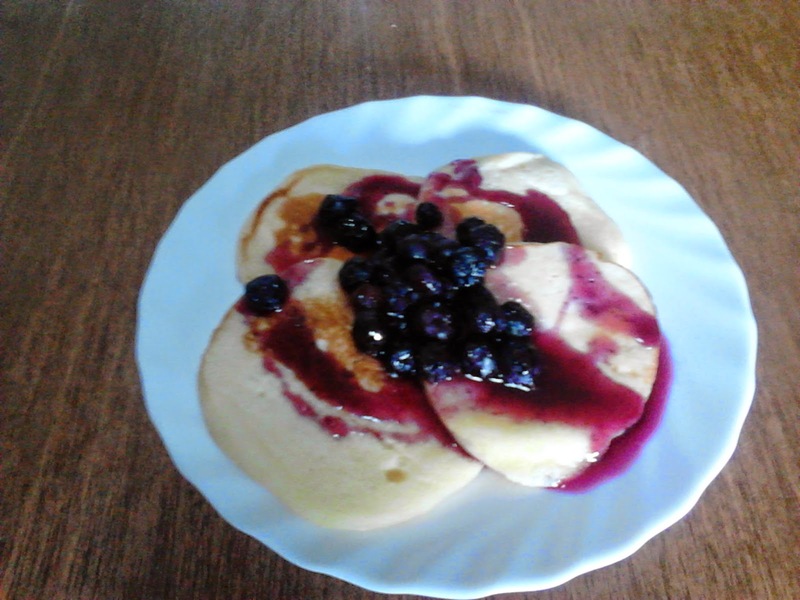 I also made some blueberry syrup to pour over the pancakes. This is easy to make and will be quite happy simmering away on the stove while you cook the pancakes. Place the blueberries and water in a pot and bring to the boil. Reduce the heat and simmer until the berries cook down a bit, then add the sugar and cinnamon. Take it off the heat when it is done. Heat up a frying pan (I use my electric one as I can cook more all at once) and grease with a small amount of butter or olive oil. Once the oil is hot, use a ladle to scoop out some of the batter and pour it into the pan. As I was feeding 5 of us, I prefer to use a tablespoon and make pikelets, but this is up to you. Wait until bubbles appear on the pancakes then flip them over. Complete this process until all of the batter is used. This took me about 45 minutes, by which time I was seriously concerned my children would turn to cannibalism as a means of sustenance. This is certainly not a recipe to try if you are in a hurry, but then again I did make heaps. When the pancakes are cooked, serve them up with some of the blueberry syrup drizzled over the top. This was my first time making buttermilk pancakes, and I must say they were absolutely delicious. Fluffy and soft, they reminded me of the pancakes served at our favorite eatery. I will definitely make them again. Any leftover blueberry syrup is delicious with Greek yoghurt, or added to a muffin or cake mix. I hope you have had a wonderful and recharging weekend. On no! It does freeze really well. At least now you know!